Just Policy Blog: How Committed Are We? 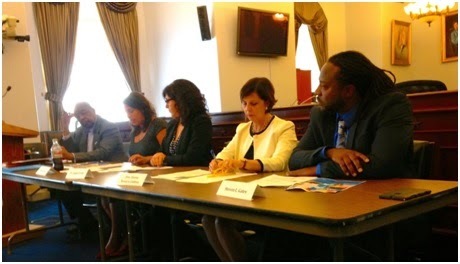 Maybe it was the location or my personal perspective being a first timer on the Hill, but Rep. Tony Cardenas opening remarks for the Building Safe and Strong Communities: A Conversation about Community-Based Alternatives for Juvenile Justice-Involved Youth Congressional Briefing really resonated with me. His words were powerful and passionate. justice related professionals that filled the seats, but yet Rep. Cardenas was also reaching out to the whole Hill, the others beyond the room. He asked just how committed are we? Are we as committed as Martin Luther King Jr. who marched on Washington with thousands of committed individuals? He expressed the dire need for truly committed individuals to express their commitment strongly with the issue of the incarceration of juveniles and the overrepresentation of minority youth, especially African-American youth. Rep. Cardenas makes an excellent point, but as I enter the public policy sector of criminal justice and especially of public policy, I see the march being made. The current group of extremely passionate and driven individuals making that march is very much present and devoted. Good examples are the very panelists that were introduced by Rep.Cardenas. The panelists represented all different areas of the juvenile justice system. Judge Denise Navarre Cubbon has implemented very progressive programs such as RECLAIM Ohio that greatly reduced the amount of young people at the Ohio Department of Youth Services institutions, and allocated those funds to create assessment centers that create alternatives solutions to incarceration sentences. Shaena Fazal’s research and subsequent report, Safely Home, published by Youth Advocate Programs, names ways that this issue of over using incarceration with juveniles by pointing out the “bright spots” where programs and the system are working in partnerships with the communities that juveniles come from. Dr. Angela Irvine with the National Council of Crime and Delinquency, discussed three clear ways to aid in this issue: 1) sight and sound separation between youth and adults whenever youth are held in an adult facility; 2) status offenders should not be incarcerated; 3) states need to continue to try to decrease the racial disparities grossly apparent in the system. Steve Gates is a role model in his own community who works closely with the Youth Advocate Programs. He expressed the need to take an individual approach with each juvenile justice case not with a groups of kids and that there cannot be a completely punitive approach to juvenile justice. The significant racial and ethnic disparities in the system, particularly for African-Americans youth in the system. Dr. Irvine mentioned a statistic from her research: in 2008, African Americans were three times overrepresented in the juvenile system and there was an 80% disproportionately rate for all youth of color. For a first timer on the Hill, I actually left feeling that there are those people that will continue to fight with a commitment that matched great advocates of the past. There were some big issues discussed, but overall, I felt like policymakers, researchers, advocates, juvenile justice professionals, and politicians are all on the same page as to what needs to be done. Even more important, they understand how it needs to be done in order to fix the ineffective and overuse of the incarceration of youth. I have no doubt that the right solution will get put into place.